Gustav Holst�s The Planets is one of the most influential works of the 20th century, at least in the realm of film scores. With the current popularity of science fiction movies and the influence of John Williams�s music on the genre, most people have heard the derivatives of this marvelous work. Williams, of course, studied and derived much of his famous Star Wars soundtrack from The Planets. The Imperial March is derived directly from Mars, The Bringer of War; Leia�s Theme resembles Venus, The Bringer of Peace. Thus, in some form, everyone knows this music, whether they consciously realize it or not. When you approach something so familiar and so often recorded it is imperative that both the performance and the sound quality are excellent. After all, if the recording is not first-rate, one can easily find another selection to better it. Measured by this standard, the Atlanta Symphony is quietly becoming one of the premier symphonies in America. They consistently release excellent performances recorded using some of the finest sound engineering available. The Planets, with its wide dynamic range and sudden shifts in timbre and volume, can easily become a frustrating experience to listen to on CD. Each movement may be too quiet or become too loud rapidly. It is far too easy to forget that the quietest parts of a symphony, performed in the symphony hall, may not translate well to the recorded media. This is not the case here, as the 20-bit recording is crystal-clear, and the dynamic range perfectly suited and balanced for the home listening experience. Additionally the musicians do an excellent job. Each movement is precisely performed and well interpreted. Mars is appropriately aggressive and brash. Venus is wonderfully peaceful and limpid. Mercury is appropriately filled with ebullient energy. Jupiter is wonderfully upbeat, as the nuances in the low strings that often don�t translate well to recordings come through here. Saturn can plod along and become dull if not well conducted, but that trap is here avoided. Uranus is impressive in all of its Dukas-influenced Sorcerer�s Apprentice way. Neptune is mysterious and undefined, and that is exactly as it should be. In fact this is all predictably good ... and a good thing too. The Atlanta Symphony is not attempting to forge its way onto new ground, but rather to improve on pre-existing recordings through a better knowledge of the medium. The performance is very good, though it can be argued that have been better performances but that�s a matter of personal preference. This is in fact as good a recording in that realm as this reviewer has ever encountered. The sound quality is excellent, if for no other reason than because the equipment is better than it was in previous decades. If the quality were not good then there would be a great deal of disappointment with such a new recording. As for the music it is both familiar and satisfying. Somehow that too seems appropriate. After all, Holst was not attempting to write a work that would be totally unlike anything ever written before him. The influences of Stravinsky, Dukas and Debussy are immediately evident. Holst was attempting to use language that had already been established in a recognizable way. His success is what makes this piece a masterwork. In summation, this is a very good recording of a very familiar work. What makes this disc so impressive is that it is so good in so many categories. 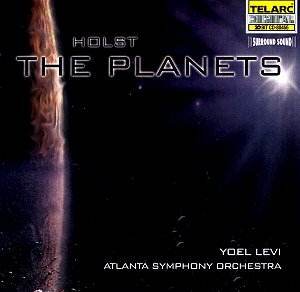 If you are looking to add a recording of Holst�s The Planets to your collection, this certainly would be an excellent choice.